Juicy and delicious lamb burgers with creamy goat cheese and avocado – and easy and healthy dinner that’s on the table in 15 minutes. Has the weather warmed up where you are? Practically overnight we went from dreary, wintery days to temperatures in the mid-eighties – great for planting our tomatoes and peppers this weekend. It’s suddenly al fresco dining season around here, and we’re planning to soak it up while it lasts, or rather before the cloying Summer heat and humidity set in. Over the weekend, the Honey and I went to our downtown farmer’s market for the first time since it opened for the season, and picked up some great, local produce and meat for the week. 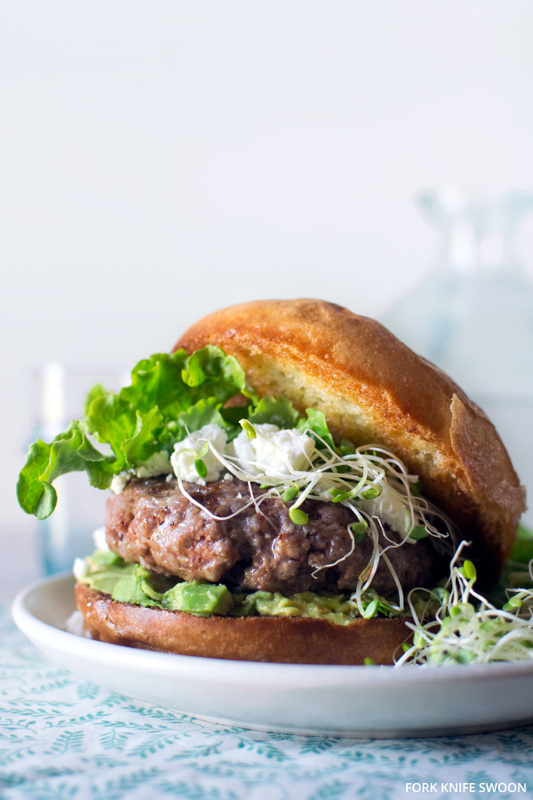 We took home this ground lamb, which made its way onto a big brioche bun topped with fresh avocado, creamy goat cheese and greens, making for a healthy, tasty burger that we think tastes best served outside in the Spring sunshine. 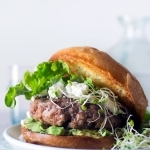 Easy and delicious Lamb Burgers with Goat Cheese and Avocado, ready in under 15 minutes. In a large bowl, use your hands to mix together the lamb with the spices until evenly combined. Form into four patties, about 3/4-inch thick. In a grill pan or over an open barbecue grill, cook over medium-high heat until cooked through, about 4 minutes per side. Meanwhile, lightly toast the buns. When the burgers are cooked, top with the goat cheese and avocado and any other desired toppings, and serve immediately. I’m a vegetarian so didn’t try these but recently made these for my son and husband, and they raved about them. I’ve made them twice in three weeks! So easy and apparently very flavorful. Nice recipe! Get rid of everything but the patty, add salt &pepper, kings Hawaiian bun, bacon, cheddar, lettuce tomato, onion and mayo and this is a killer burger. We just made these burgers tonight and they were absolutely delicious! The only changes we made were to add some chopped garlic and oregano to the meat mixture. But overall, the curry was definitely the star with the lamb, and the goat cheese went so well with the burger as a whole. The only optional topping we used was arugula. I really could not get over how much I loved these burgers! Thanks, Amy! I’m so glad you liked them… they are a big hit around here too! Mmmmmm, love the idea of lamb burgers!